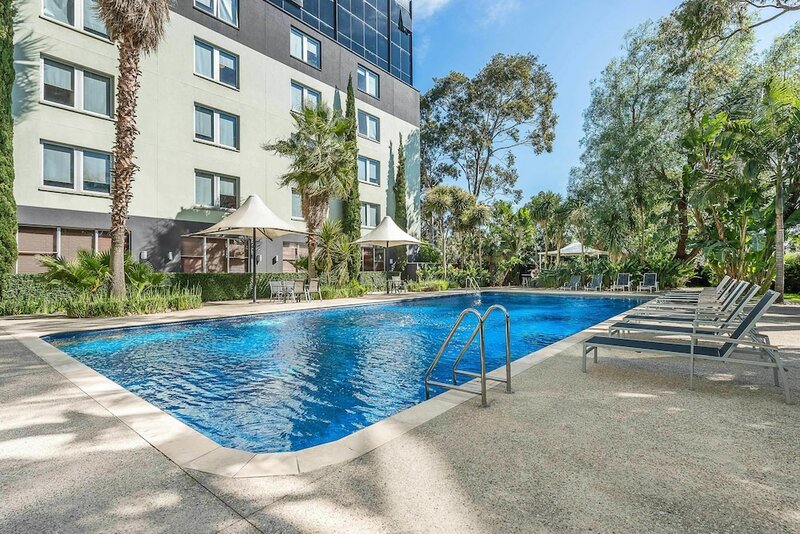 When you stay at BreakFree Bell City in Preston, you'll be in the business district, within a 15-minute drive of Austin Hospital and La Trobe University. This hotel is 5.1 mi (8.2 km) from University of Melbourne and 5.7 mi (9.1 km) from Princess Theatre. Make yourself at home in one of the 461 air-conditioned rooms featuring refrigerators and flat-screen televisions. Wireless Internet access (surcharge) keeps you connected, and cable programming is available for your entertainment. Private bathrooms with showers feature complimentary toiletries and hair dryers. Conveniences include phones, as well as desks and coffee/tea makers. Don't miss out on the many recreational opportunities, including a sauna, a fitness center, and a seasonal outdoor pool. This Art Deco hotel also features complimentary wireless Internet access, concierge services, and an arcade/game room. Getting to nearby attractions is a breeze with the complimentary area shuttle. Grab a bite at JD’s Diner & Burger Bar, one of the hotel's 3 restaurants, or stay in and take advantage of the 24-hour room service. Snacks are also available at the coffee shop/café. Relax with your favorite drink at the bar/lounge or the poolside bar. Full breakfasts are available daily from 6:30 AM to 10:30 AM for a fee. Featured amenities include limo/town car service, a computer station, and dry cleaning/laundry services. Planning an event in Preston? This hotel has facilities measuring 5382 square feet (500 square meters), including a conference center. A roundtrip airport shuttle is provided for a surcharge (available 24 hours), and self parking (subject to charges) is available onsite. In addition to a seasonal outdoor pool, BreakFree Bell City provides a sauna and a fitness center. Dining is available at one of the hotel's 3 restaurants and guests can grab coffee at the coffee shop/café. The property also has a grocery/convenience store. Guests can unwind with a drink at one of the hotel's bars, which include a poolside bar and a bar/lounge. A computer station is located on site and wireless Internet access is complimentary. Event facilities measuring 5382 square feet (500 square meters) include a conference center. This Art Deco hotel also offers tour/ticket assistance, an arcade/game room, and multilingual staff. For a surcharge, a roundtrip airport shuttle (available 24 hours) is offered to guests. Parking is available onsite for a surcharge. BreakFree Bell City has designated areas for smoking. BreakFree Bell City has 3 restaurants serving breakfast, lunch, and dinner. JD’s Diner & Burger Bar - This restaurant specializes in local cuisine. Guests can enjoy drinks at the bar. A children's menu is available. Happy hour is offered. Pantry Cafe - This café serves light fare only. Recreational amenities at the hotel include a sauna, a fitness center, and a seasonal outdoor pool. This hotel will place an authorization for AUD 200 to cover incidental charges. For more details, please contact the property using the information on the reservation confirmation received after booking. Book a stay in a valid rate plan displaying the "Free beverages for 2" tag for travel now - July 12, 2019, and receive 2 welcome drinks.